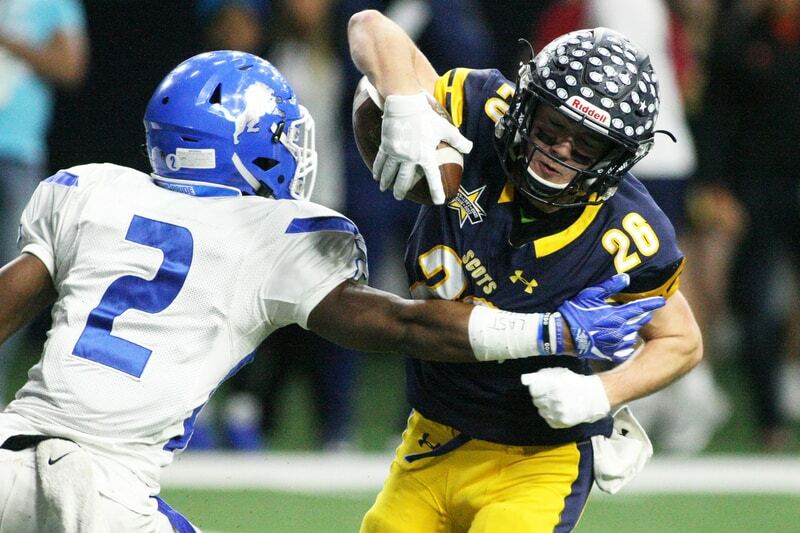 FRISCO — With just over 10 minutes remaining in its Class 5A Division I state quarterfinal, Highland Park’s season was on the brink. Then, trailing by three touchdowns, the HP comeback machine started up again — the same one that led the Scots to some miraculous rallies during last year’s state title run. 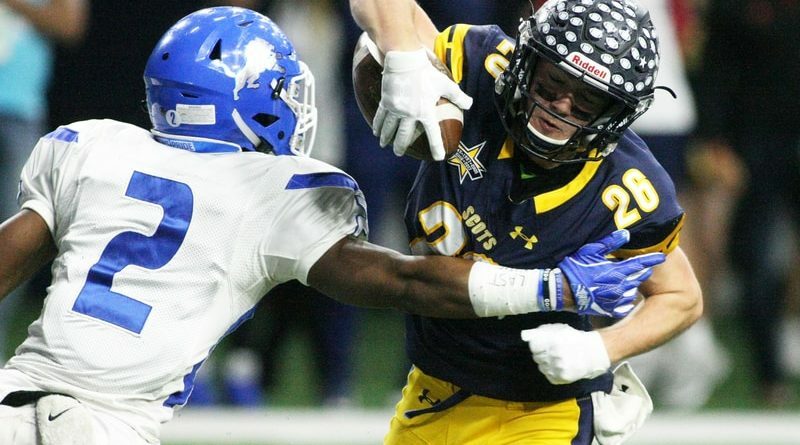 HP scored 28 unanswered points in the fourth quarter, including the game-winning touchdown with nine seconds left, to earn a 42-35 win over Tyler John Tyler on Saturday at the Ford Center at The Star that secures a place among the most memorable postseason victories in the program’s storied history. Somehow, the hopes of a third straight crown are still alive for the Scots (14-0), who will face fellow unbeaten Denton Ryan on Dec. 15 in the state semifinals for the third consecutive year. Junior quarterback Chandler Morris engineered the late rally by throwing two touchdown passes and running for two more scores in the fourth quarter alone. His 1-yard plunge into the end zone in the closing seconds gave the Scots their only lead of the game — and ultimately the victory. Yet just as much credit goes to an HP defense led by Hudson Clark, whose second interception of the day with 9:10 remaining was perhaps the most critical piece of the comeback puzzle. The Scots had been worn down by a Tyler rushing attack that accumulated 283 yards in the first half alone and dominated time of possession through three quarters. However, HP forced two punts and a turnover down the stretch. Devlen Woods scored his second rushing touchdown of the day in the closing moments of the third quarter to give the Lions a 35-14 lead, capping a stretch in which Tyler scored three consecutive touchdowns. But HP never lost hope, calmly driving down the field and trimming the deficit on a 6-yard touchdown pass from Morris to Benner Page with 10:18 left. Clark picked off a pass just two plays later, and it only took HP four more snaps to reach the end zone again, when Morris found Bennett Brown for a 28-yard score to make the score 35-28 at the 8:18 mark. The Scots subsequently forced a three-and-out from Tyler, which punted for the first time with 6:23 left in the game, pinning HP deep in its own territory. The Scots responded with arguably their best possession of the entire season, covering 93 yards in only eight plays. Morris completed all five of his throws on the drive, and tied the game with a 14-yard scamper to the end zone with 3:25 still remaining. A short punt on the next Tyler possession gave the Scots a short field and enough time to attempt a game-winning drive. With less than 30 seconds on the clock, Morris floated a beautiful spiral down the sideline to Finn Corwin for 45 yards, then scored himself on the next play. For the game, Morris tossed three touchdown passes and ran for three more scores. He completed his final eight throws after enduring a 5-for-14 first half. As a team, HP had just 31 total yards in the third quarter but 225 in the fourth. The Scots’ surge coincided with some untimely miscues by Tyler, which was called for five penalties in the fourth quarter. The Lions had 95 penalty yards in the game, compared to just 15 for HP. The teams traded touchdowns in the first half, with HP twice answering Tyler scores. Morris threw an 18-yard touchdown strike to Ben Smith midway through the first quarter. In the second quarter, his 31-yard scoring run capped a 99-yard drive that would have been the most noteworthy achievement in an average game. For the first three quarters, the Lions (10-3) controlled the tempo with a rushing attack that featured an array of dynamic playmakers. Woods and Roderick Hawkins combined for 243 rushing yards and three scores before halftime. Tyler’s 21-14 halftime advantage could have been even larger had it not been for Clark’s diving interception at the HP 1-yard line early in the second quarter. The Lions marched down the field again to open the second half, and Cameron Grant’s 5-yard touchdown run gave Tyler a two-score lead for the first time. Woods finished with a game-high 152 rushing yards on 11 carries, including a 61-yard touchdown scamper. He also connected on nine of 14 passes for 146 yards. Hawkins added 147 yards and two scores. Corwin tallied a game-high eight receptions for 109 yards, while Page rushed for 75 yards on just seven attempts for the Scots.